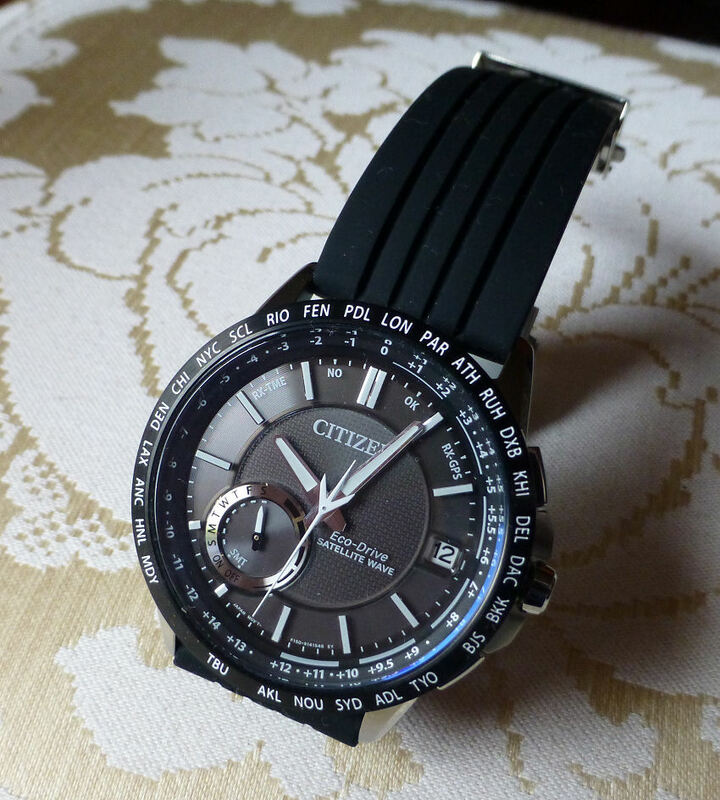 As you probably know if you read my web site, one of my favorite models is my Citizen AT, which I’ve had for several years now (2010). I love it because I travel a great deal and it is easily one of the simplest of watches to use for different time zones. Simply pull out the crown, turn the second hand to the time zone required and push in again – job done. All you have to know is where you’re going! 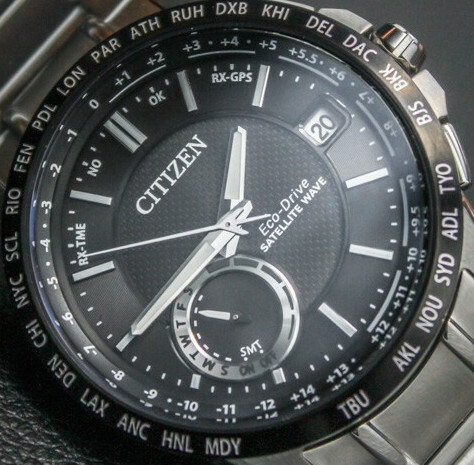 Citizen CC3005-85E Solar, GPS – about as good as it gets. . .
GPS offers so much more, yet the earlier GPS enabled Citizen watches didn’t really do it for me, as they had an angular case shape left over from the Attesa series, which if small to average wrist size, they never quite fitted as snugly as I wanted. For me that all important lug to lug size being seemed a little bit too long and at the wrong angle and so over hung the wrist. This latest model CC3005-85E however is a different ball game altogether. It goes back to the more conventional and in my view a sensible case shape, which fits my wrist just fine and although cased is 44 mm x 13 mm, has that neater lug to lug dimension and angle. Now where my older AT model was great, this new GPS model is exceptional and it really comes into its own in all respects. Using the new F150 movement, it has an increased accuracy out of the box and even without GPS or Radio Control is within +/- 5 seconds per month, which is really, really good. Add in the GPS function and with one press, hold and and release of the lower right button (A) until the seconds hand moves to rx/time. It then synchronizes with satellite (confirms by moving to OK) then corrects to the exact local time in all around 3 seconds. This is a lot quicker than the ground based Radio Control models I’m used to and indeed any other GPS model I’ve seen. Update – (Note – owing to the accuracy of the F150 movement (+/- 5 secs) this watch doesn’t really require an auto time check every day – but if more than 6 days since the last time check, it will automatically seek & correct the Time via satellite between 6am and 6pm). When traveling it can now locate (previous models did not have this feature) which out of the 40 time zones you are in by a longer press, hold and release (4 secs) of the lower right button (A) – the second hand this time will point to rx/gps and calibrate the Zone and Time using 4 satellites within just 3 minutes. As before if successful it will quickly flick to OK and then the Zone and Time are corrected. So no need to do much of anything again except on occasion push a button – and that means ease of use (so often the enemy of complication watches) which is quite amazing. You can of course quickly set a Zone & Time without using GPS at all by simply pulling out the crown to Pos 1, turning to the Time Zone/City required and push the crown in, just like my old AT model. Simple display plus complication technology a sure fire winner. I like the fact this model not only calibrates and shows the Time, Day and the Date, each of which is shown on the dial, but displays it in analog on a simple and clear, easy to read dial. I am really pleased that Citizen have achieved what I have long been an advocate of – a simple “display v complication” ratio – and this model manages this to perfection. The Solar cell internal charging system is also nothing short of spectacular (updated yet again) and can operate for a day after just 3 minutes in the sun. I find this extraordinary and coupled with the fact that, once fully charged, if you chuck it in a drawer, it will manage via its Power Save function to keep ticking away internally for up to 7 years! Even without Power Save activated it will run happily for around 2 years. Now I have to ask myself if I actually need all this technology, as being perfectly honest my current AT model does just fine, but HEY! this is tech done right! And I collect watches, so it was a no brainer that I was going to get it – wasn’t it! Practically I like the fact it has decent luminous hands and baton markers and the dial is uncluttered, very clean, clear and very easy to read. There is also a Battery Charge indicator around the right segment of the sub dial, marked with 5 lines. Battery Charge shows what is in the tank so to speak, the level of battery charge – press and release the upper right button (B) and the sub-dial pointer indicates the level of charge – towards the top line is the best (see image) and will give up to 24 months. The Power Generation indicator means this – if you want to ensure the watch is charging it needs a position where it can get to light. Outside sun is the best of course as it will charge quicker. So to check you have a good position for charging – press and release the upper right button (B) again and this time note the analog hands. These will close together forming a large pointer which will indicate on the main dial (note the 6 lines around the dial from 12 to 6 ) if the watch is getting enough light to charge. The 6 o’clock position is the best (see image). Note if below 5 o’clock then it’s better to find somewhere with more light to efficiently charge the battery. I’ve found with mine that even outside on a white cloud dull day the Power Generation pointer is indicating MAX, so it’s getting enough light to charge properly. That’s gratifying as where I live to see the sun is a cause for celebration! 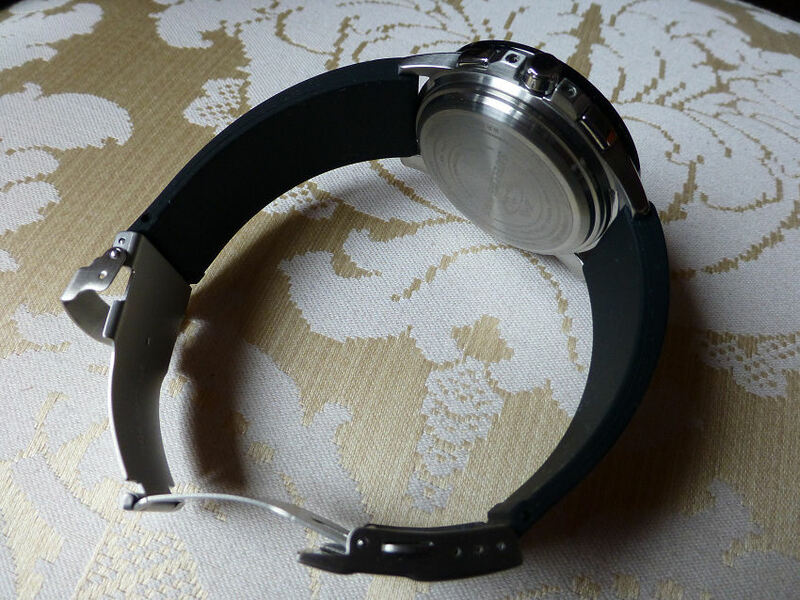 I tend to leave most of my solar powered watches on a window ledge in the house and they all have full charge indicated – it always ensures my watches are at their best. Note the watches cannot overcharge in normal light situations. (they could of course overheat if left on a dashboard in direct sun). Also I would note that if you wear the watch as your daily beater and you usually have bare arms then the watch will more than likely always have full charge. If however you wear the watch under a sleeve, then you should make a point of locating it somewhere there is good light, at least for a a few hours every month. But you can easily see the Battery state at any time so you can make your own regime that works for you. 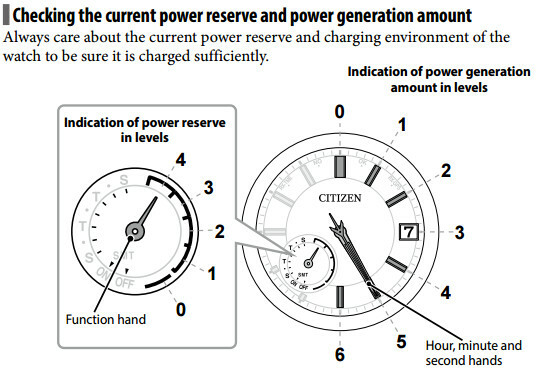 Clever indications of Power Reserve and Power Generation. 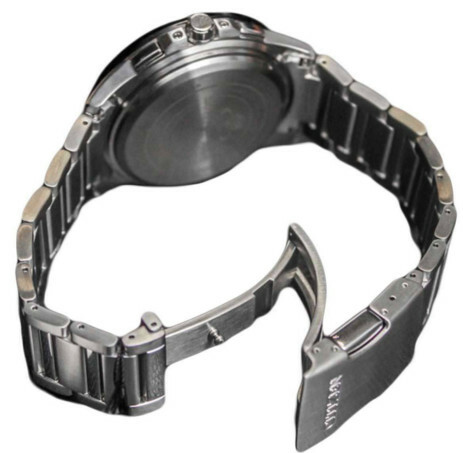 High quality bracelet with standard spring-bars (24mm) – so if a strap preferred can easily be changed. Sapphire glass is used so few scratches will ever bother you and with its Perpetual Calendar until February 28th 2100 should also see me out (if not it means either I’m unique in my own right, or my watch has got a problem, and I know which one is likely to fail!). And perhaps best of all, for me, is the fact that this wonderful technology comes in a familiar and, considering the technology, an understated style and just as unobtrusive as my Solar AT model. 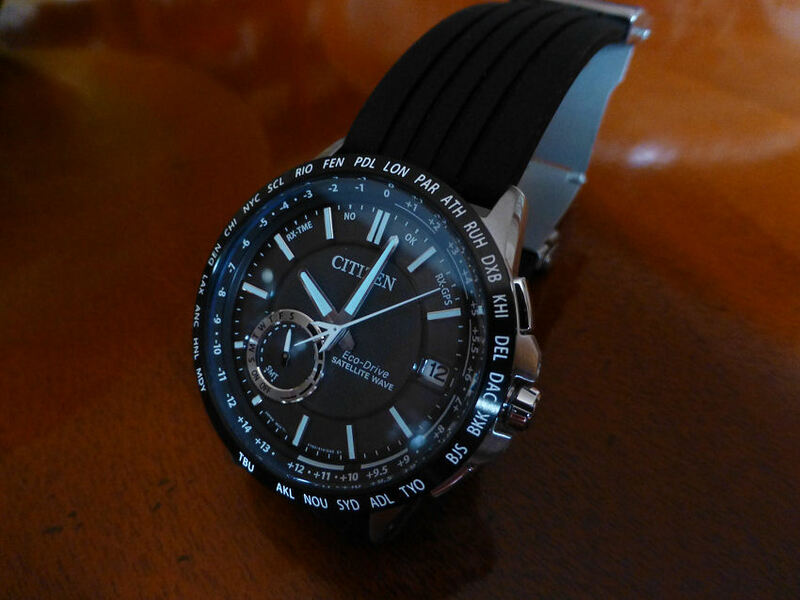 Citizen have definitely got this one right – improved and upgraded technology in almost every department and managed it all in a sensible case size. To then display that technology without an F16 cockpit dial set up is also to be applauded. I love it and I love this one too. There are competitors out there of course not least Seiko, but I’ve had a look at them and so far they don’t do it for me! They all tend to look a bit cluttered and look complicated and I have the impression the technology seems to be shoehorned in to the case. And on the wrist they are just not that super easy to read. But Citizen with this model have very successfully merged technology and simplicity together in a very sleek and dare I say conventional watch – complicated yes, high tech yes, but super simple to use. Now for me that’s real progress. A friend has a Seiko GPS model though I prefer the Citizen. Not sure of the model but from what I’ve seen this Citizen has a few plus points over it. The Citizen has a much clearer and uncluttered dial in comparison, it also has a smaller case, a much longer charge life up to 24 months (7 years with Power Save) and it is a far more accurate watch movement (Seiko is +/- 15 secs – and Citizen +/- 5 secs), so it’s really not essential to time check every day (why they’ve not provided an auto time check function). 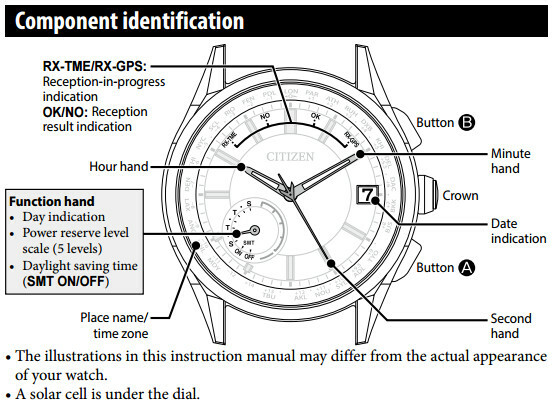 The main points for me are the simple uncluttered dial, the size and the ease of use of the Citizen. However as always in his fast moving field, no doubt the next model of either watch will improve, so it’s up to personal choice at the end of the day, but I certainly love this one. Note – The Time check indicator if selected will indicate probably NO if you haven’t time checked for 6 days – this is just a reminder to Time check every so often, though with a non GPS accuracy of +/- 5 secs I suggest it hardly matters. I’ll probably do a Time Check/Adjust monthly maybe . . . . Note – Whilst a GPS watch uses Satellite signals this doesn’t mean it doesn’t use Radio signals, because it does of course. Each of the main 24 satellites around the earth carries an Atomic Clock and the GPS watch picks up the radio signals from these. It should also be noted that the satellite clock is compensated and a small correction applied. The space based clock,s owing to the fact they run in a reduced gravity, actually run slightly fast by around a net 38 microseconds a day compared to ground based clocks. Not that this should worry anyone – as long as the computer chips within the clock works of course!